My Lifelong Marathon - Angelena is 2! Happy Birthday Angelena! As they say, time flies... I cannot believe that it has already been 2 years! Here's a little something that we put together. Enjoy! 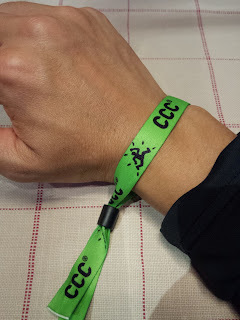 So, I attempted this 100km CCC race, where I was allowed 26hrs to complete. Unfortunately or fortunately, I pulled out after 42km to record my first ever DNF (Did Not Finish). The mountains had triumphed over me. Not something that I am proud of, but definitely an experience / learning that will be staying in my head for a long while. 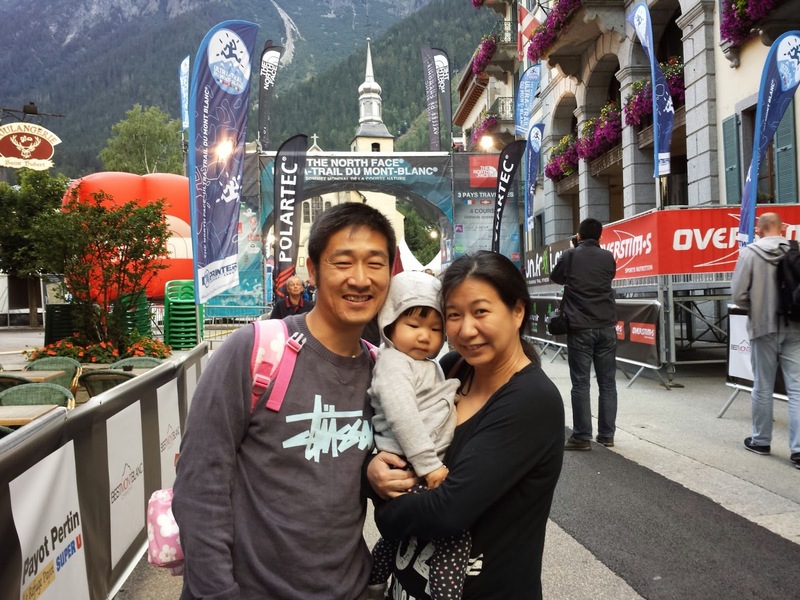 The 3 of us (Lena, Angelena and I) arrived in Chamonix via Geneva at late afternoon. 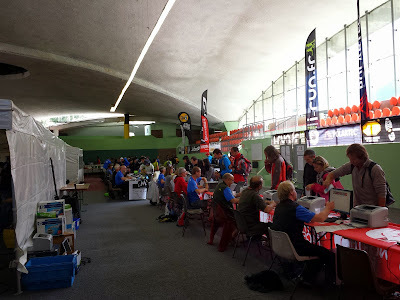 By the time we settled into our accommodation, registration was closed and I can only complete registration the next day. 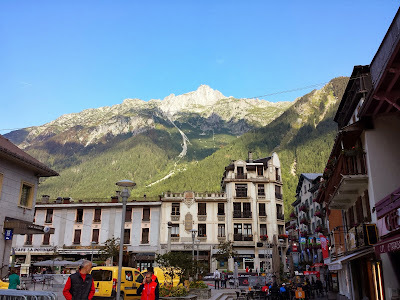 It is summer in Chamonix and there was still daylight up until around 8pm. We wondered around the village centre, soaked in the atmosphere, did some touristy thing, before heading off for dinner and bed. Got onto the streets and headed to registration as soon as we finished breakfast. 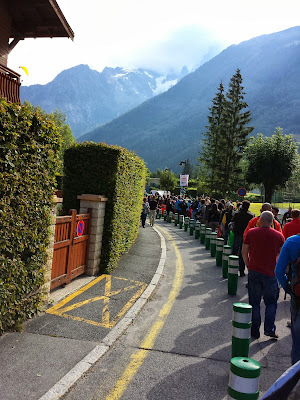 Already, there was a queue as UTMB runners were also doing their registration on this day. The processing was a bit slow and it took me about 40mins to complete the entire registration process. Spent rest of the day exploring the village centre. Throughout the day, there was constant flow of TDS runners coming through the streets for their finish. I can feel all the different emotions of the runners running towards the finish. The atmosphere was electric. People on the streets literally stop what they were doing and clapped and cheered them on. I have never experienced anything like this before and was a bit overwhelmed and touched by the support shown. It was unreal. Woke up at 4:30am and do my usual pre-race routine. 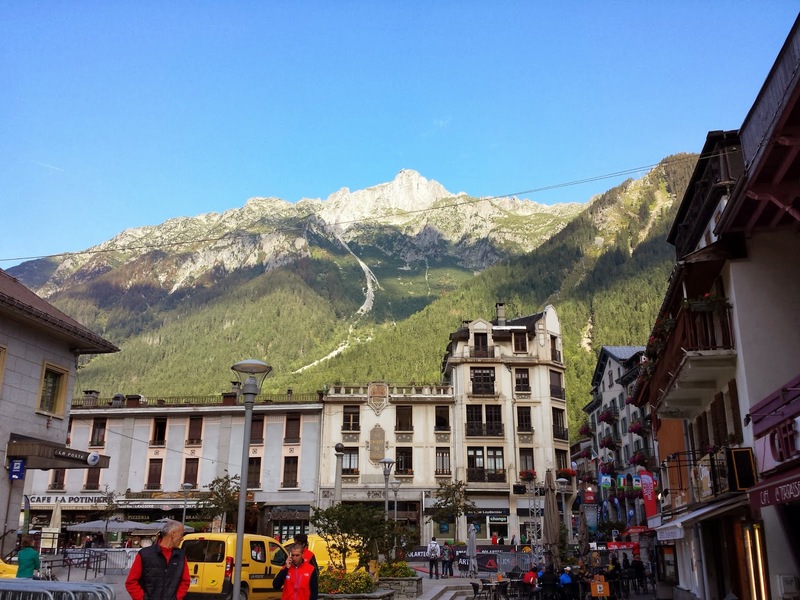 The start of the race was in Courmayeur, Italy and there was shuttle bus service for CCC runners staying in Chamonix. 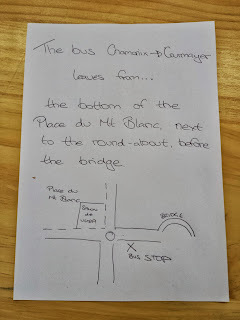 Left the apartment around 6am and got to the shuttle bus pick up point after a short 10mins walk. Arrived at Courmayeur after 30mins of bus ride. From here on, it was a case of monkey see monkey do for me. I followed a group into a sports centre where everyone were either taking a nap or having a munch. At round 8:15am, people started to pack up and headed towards the start. It was a short 10mins walk to the start. Dropped off my finish bag and squeezed into my starting wave (9:15am), which was according to race bib number. I was filled with anxiety and excitement. I still could not believe that I am starting this race! All in all, there were 1,900 runners with 3 starting waves. First wave was off at 9am, followed by 9:15am and 9:30am. 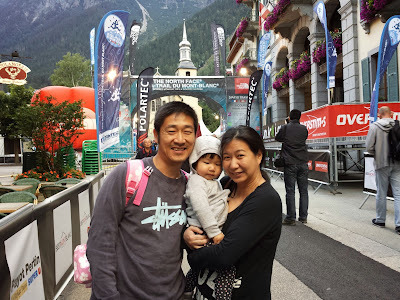 Ran along the streets of Courmayeur for the first 2km and it was fantastic. Supporters cheered us on with ringing of cow bells and the constant “Bravo” along the way. We then hit a winding road up before entering into the forest. It was basically climb, and more climb up the mountain. This first stretch was congested. There was constant stoping along the way to wait for people in front to either cross a stream or go down some slippery rocks. I didn’t mind it, but was a bit annoyed with the occasion queue jumper. I was trying to enjoy myself with the amazing views. After dunno how long, we were out of the forest and we were on single tracks where the trails opened to the sky. There was still a lot of climbing to do. My legs and my breathing were getting heavier with each step. The constant climbs sucked my energy bit by bit and before I know it, I was feeling hungry and weak. I shortened my feeding timing in an effort to replenish the loss energy. This was a constant fight all the way to the first check point (CP). Looking back at my climb. There were sections where I can see what lies ahead of me and I was able to prepare mentally for the climb. There were sections where you can only see the upcoming climbs only when you arrive at the turns. Those ones drove me nuts! The constant “are we there yet” in my mind did not help. I was so damn happy to finally see the marshal. He scanned our race bib and I took a few moments to enjoy the view from the top. Looking at the elevation, I can understand why I took almost 3hrs to complete this leg of only 10.4km. Another look before heading down. I was relieved that I got over the first big climb, and was looking forward to CP2 where there will be food and drinks. Although it was downhill, I couldn’t go too fast as I was still recover from the previous climbs. Took me 30mins for this leg, but I spent at least 15mins at the CP, eating, drinking and resting. I was enjoying the stunning views and was so reluctant to leave this CP. 15mins is a long time to spend on a CP but I just couldn’t get my bum off the seat any earlier. This stretch was pretty “flat” in the sense that there was no massive up or down. Don’t get me wrong, it was still tough! I managed to run parts of it, but at a slow pace. The sun was smiling (or maybe laughing) at us and my feet began to feel warm. I spent 1hr 5min on this leg. And again, I spent almost 15mins at the CP, just feeding and daydreaming. My mind told me to keep on moving, but my body just want to stay there a bit longer. So folks, mind over body did not work here. Can you now understand why I spend so much time at a CP? Although this leg was only 5.1km, it still took me a little over an hour to complete. The last 2km of steep downhill took a toll on my feet. I could feel several hot spots developing on my feet. I had to slow down on the downhills (arggg!!!) so that I can avoid blisters being formed. When I reached the CP, I sat down and put tapes on the hot spots. This time round, I was conscious not to spend too much time at the CP. But, I still spent 15mins here, which included taping and feeding. So, only 4.6km for this leg. 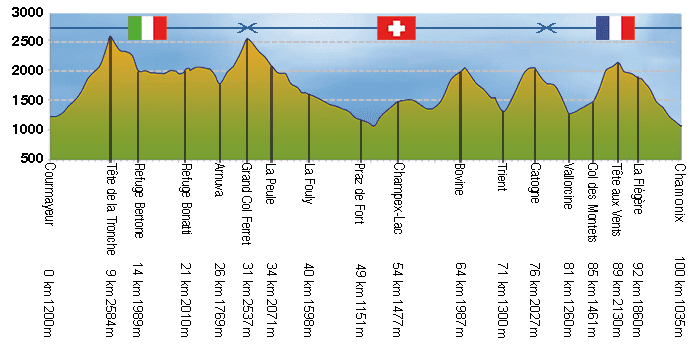 But wait, this will take me to the 2nd highest altitude point of the race. Wahahaha... Crossed a river shortly after leaving the CP and there she was, up, up and away. 2 freaking hours for a 4.6km stretch. Yes, I was slow. My legs were getting heavier and my feet were hurting. I was constantly hungry and thirsty. But when I got to the CP at the top, it was all worth it! I was amongst the clouds. What an awesome feeling! I was feeling a bit cold but was manageable. When I saw people putting on their jackets, I decided to do the same. This proved to be a costly mistake later on. There was no replenishment at this CP, but somehow I still spent at least 10mins resting before heading off. It was all the way downhill to La Fouly from here. Yeh right! 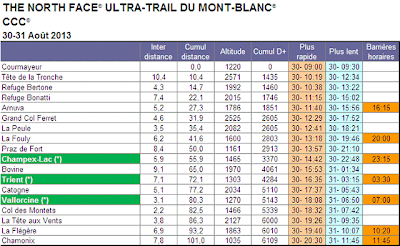 But no, I could not run fast downhill and have to constantly break my pace with a bit of braking here and there. Although the taping helped to keep the blisters away, my feet were still sore and my ugly downhill technique made it worse. My knees also decided to join in the boycott and I have to stop occasionally to give it a bit of rest. Think the cows were laughing at me. Halfway down to the valley, I began to feel warm, then hot. I was cooking inside the jacket. Had to stop to remove my jacket and hydrate. The mind was wandering a bit and the body was ready to call it quits. I continued to put one leg in front of the other and see what happened when I reach the coming CP. I made it to La Fouly after spending 2hrs for this downhill leg. The race cut-off for this CP was 20:00. I checked in at 19:47. Daylight was almost gone and I could start to feel the cold air settling in. I was left with 13mins to organise myself and get back out there. I took out my gloves, headtorch, buff and jacket, refilled my water and food supply and kept my visor and shades. I then headed to get some pasta soup to fill the tummy. Then I heard the announcement “Runners, you have 5mins to exit this CP”. My heart sank. I needed more time, I was not ready to move again. Many thoughts, both positive and negative ones clouded my minds. There were runners hurrying to get organised and get out there. There were also runners that were just sitting down, with looks of despair on their face. With less than 3mins to spare, I made the tough decision to pull out of the race. I was weak, both physically and mentally. So that was it, the end of my dream of completing the race. 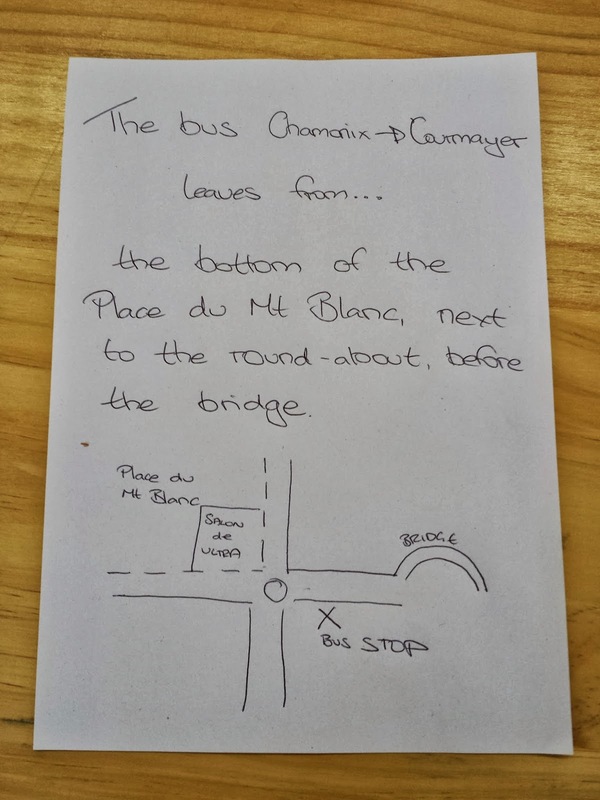 Did the “walk of shame” and took the next bus back to Chamonix. P.S. The bus was packed with mostly dropped out runners like myself (self consolation :p). Weather: I prepared for a cold race, but the weather was beautiful with the temperature around the high teens. No rain, snow or hail like the previous year. Course: I will let the pictures and course information speak for themselves. Check points, staff and volunteers: The CPs were well stocked with food such as cold meat, cheese, cakes etc. However, I could only get energy bars and not gels at the CPs. Maybe I didn’t look properly. Not all staff can speak English, but I pretty much did not have any problem getting what I need from the CPs. They were friendly and ever willing o assist. Thanks guys! · Training. 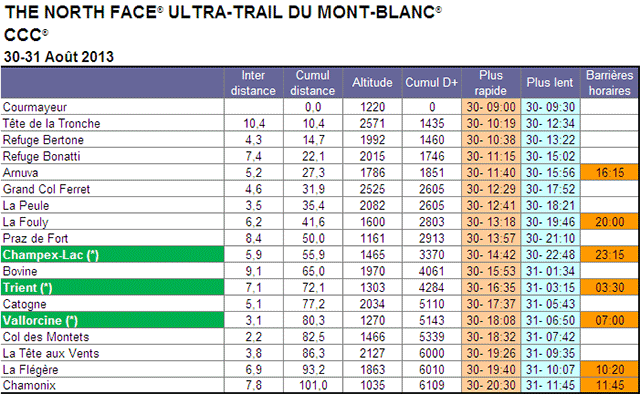 To really enjoy the race, I need to put in more hills or mountain sessions. · Need to carb load!!! I did not have my usual carb loading (I so missed my rice...) prior to the race. I was enjoying all the fabulous food in France and they proved to be not adequate for my race. · Bring extra pair of shoes. I should have brought an extra pair of shoes for warmer conditions. My Salomon Speedcross 3 CS is great, but somehow the heat and friction created from this course were cooking my feet. · Spend less time at CPs. I failed miserably in this race. Spent way too much time slacking at CPs. · Listen to my body. I was saving my fuel and sticking to my race plan. What I should have done was to increase my feed and hydration frequency much earlier on. I was truly beaten by a worthy opponent. 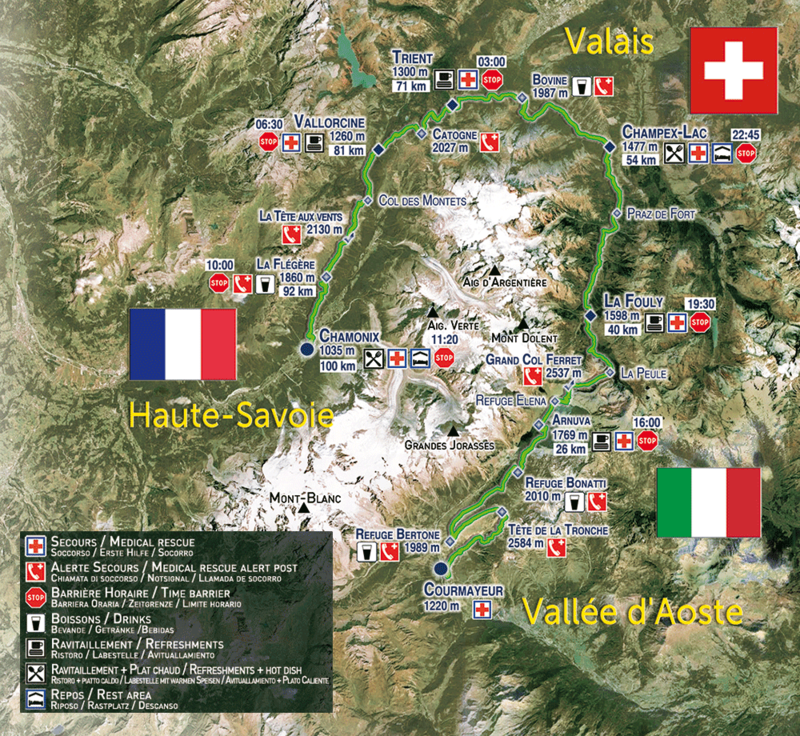 I am pleased to at least make it to Switzerland (La Fouly). Rest assure, I will be back for revenge / redemption hopefully sometime in the not too far future. For those who are thinking about doing the race, don’t think, DO IT!!! You will not regret it. Register for it and everything else will fall in place.